What stands between a book and its Jordanian reader? Why did Susan Abulhawa’s Mornings in Jenin fail to satisfy the press and publications law, or Hassan Blasim’s Madman of Freedom Square? Part of the censorship process is that the process itself is a mystery. This report, by the staff at 7iber, aims to open censorship to greater discussion. Is the Censorial Grip Loosening? However, the Department bypasses the legal procedure, which mandates that a court order be issued in order to ban a book. This has made the department’s task of painting this forgiving picture easy. The fact that court orders do not exist enables the Department to deny the banning of a book, due to the lack of evidence, according to Osama Qasim, the Executive Director of the University Book Center. Other informal forms of censorship are sometimes employed in the Department of Press and Publications. Other informal forms of censorship are sometimes employed in the Department of Press and Publications. According to Kayyali, some books were permitted after agreements with the publisher or distributor to delete phrases or sections from the text. For example, the Department of Press and Publication requested that the phrase “God has forsaken us” be omitted from the book “Leagues of Groans Waiting” by Zaid Al Shahid, and the “Atlas of 1948 Palestine” by Sulieman Abu Sittah was permitted on the condition that a quote from Avi Shlaim’s “Collusion across the Jordan” be removed from the footnotes. In some instances, the process of reviewing a book and issuing a decision about it is delayed within the Department, which is often considered as good as ban, according to Mudher AlJazeera of “Books @ Café.” This happens especially in the case of English books, of which a limited number of copies are usually imported. This change has not come out of nowhere, according to Osama Al Qasim. Authorities do not want to leave themselves open on multiple fronts, especially after the political opposition taking to the streets in the last few years. “They are trying to gain the acceptance of religious conservatives on both sides, Christians and Muslims,” Al Qasim says. He describes what happens within censorship procedures, which consult the Department of Fatwa or the Synod, as granting an individual’s judgment at the expense of the rule of the law. Nevertheless, this does not mean that the fundamentals of political censorship have been undermined, as any books which arrives from outside of Jordan with a title that is directly or indirectly linked to Jordan or any of its kings undergoes scrutiny and perhaps censorship, especially if it contradicts the official historical narrative in any way. Over at 7iber, you can find a collection of 20 banned books. Some of these titles have been banned in the last three years, and others have been banned for many years before that, and have remained so under the “ceiling of freedom” that the Department of Press and Publications has “raised” lately. Unfortunately, part of the workings of censorship is to obscure itself, so there is no complete list of censored titles. This is just a sample. Last spring, Palestinian-American novelist Susan Abulhawa traveled from her home in Pennsylvania to promote the new Arabic translation of her novel, Mornings in Jenin. As part of her tour, she was in Amman for an event hosted by 7iber. Although the event was positive and well-attended, a few people said that they hadn’t been able to find the book in stores. Abulhawa’s novel follows the Abulheja family as they are forced out of their small village east of Haifa. When Abulhawa began writing the novel, she said, it was in response to the 2002 Israeli attack on the refugee camp in Jenin. She was one of the first international observers to arrive at the camp, which had been sealed off by Israeli forces during the assault. Abulhawa, who until this time had written mainly poetry, began to write. She drew inspiration from Ghassan Kanafani’s novella “Returning to Haifa,” about a Palestinian boy raised by the Jewish family. In Kanafani’s story, the Israeli couple found the boy in the home they took over in 1948. In Abulhawa’s novel, Dalia Abjulheja is guiding her twin boys out of the city when an Israeli soldier grabs baby Ismael from her arms. The soldier brings the baby to his wife, a Holocaust survivor who can’t have children, and Ismael grows up as David. 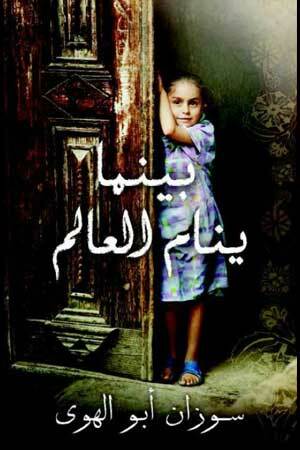 But Abulhawa doesn’t focus the story on the two boys; the novel is mainly centered on Amal, the family’s daughter. The book had a long and circuitous journey to English-language acclaim, Arabic translation, and its eventual banning in Jordan. The book was originally published by a small US press in 2006 as The Scar of David. The book’s US publisher soon went out of business, and only a few copies of the book circulated. That would have been the end of most books, but Abulhawa’s novel was picked up by a French publisher, translated by Michèle Valencia, and published as Les Matins de Jenine. From there, it made its way into several other languages, and was so well-loved that it attracted English-language attention. In 2010, Bloomsbury released a fresh edit with the title Mornings in Jenin, and since then, it has enjoyed strong reception in English. Indeed, the English version of the novel remains available in Jordan. It’s only the Arabic translation that is officially banned for “political” reasons. Iraqi writer and filmmaker Hassan Blasim doesn’t do things in the usual way. And with his Madman of Freedom Square , he published in reverse: His collection appeared in English translation before it appeared in Arabic. The stories that formed Blasim’s first short-story collection had appeared first of all on a website called iraqstory.com, where they were read by Joumana Haddad, who was then assembling a collection for Comma Press. But, although Blasim quickly found a strong champion in his UK publisher, Comma Press, it took him several years to find an Arab publisher. Blasim’s first collection, translated by Jonathan Wright, received numerous accolades: It was named to The Independent’s Foreign Fiction award longlist; it was longlisted for a Frank O’Connor short story award; and Robin Yassin-Kassab, writing in The Guardian, called Blasim “perhaps the best writer of Arabic fiction alive.” But Blasim still couldn’t find a publisher in Arabic. For his first collection, Blasim finally settled on a Lebanese publisher, The Arab Institute for Research and Publishing. However, this was not without controls: Blasim showed copies of the Arabic manuscript on his Facebook page, noting that much of the text was cut before it was published in Arabic. In the meantime, Comma Press was working with Blasim to translate a second collection, The Iraqi Christ, which was awarded an English PEN prize. Fortunately, Jordanian readers can still find all Blasim’s uncensored stories in Arabic online at http://www.iraqstory.com/. Thank you! I will read it!